After bursting onto the scene at 18 years of age, the talent and potential of Marcus Rashford has never been in doubt. Yet this season, his development has accelerated at alarming rates. The striker has been thriving in 2018/19, scoring nine goals and laying on a further six assists in 22 games. Under Jose Mourinho this season, it was evident he was constrained in a defensive system, expected to feed off scraps either as a loan striker or on the wing. This inevitably hampered his confidence so when the chances did come, they went wide of goal. But after the Special One’s dismissal, Ole Gunnar Solskjær’s arrival has reinvigorated Manchester United, particularly Paul Pogba and Rashford. With six goals in eight league games under the Norwegian treble winner, the Englishman is really coming into his own, displacing £75 million signing Romelu Lukaku in the starting XI and taking huge strides forward in his Red Devils career. Over the last couple of seasons, the 21 year old has been criticised for his lack of composure when one on one with the keeper and general decision making in the final third. Yet recently, he has become more decisive and helped United edge games they perhaps deserved to drop points in. Rashford’s shot numbers have certainly improved in 2018/19; up to 2.4 per game from 1.7 in the Premier League last season (WhoScored). These shots have meaning too, with his tally of nine goals in the league already exceeding his seven from last season, in 13 fewer games. The Mancunian’s game-winning goals against Tottenham and Leicester really demonstrate how he is growing in confidence in front of goal and delivering for Solskjær’s side. Rashford’s finishing and goal scoring this season has certainly taken the headlines. Yet his ability to contribute to phases of play and assist his teammates has been particularly impressive. The release of Pogba from Mourinho’s shackles has made the World Cup winner the creative hub of United’s side. But the England international has also been involved in creating goals alongside scoring them. This includes flick-ons, killer passes and dangerous crosses into the box. His six assists this season put him joint 9th in the league for most assists. Despite not being to able to hold up the ball or be a target man as well as Lukaku, these figures highlight Rashford’s ability to not just put the ball in the back of the net, but contribute in the build-up to chances, something that Wayne Rooney was not given enough credit for during his time at Old Trafford. Lastly, the forward’s work ethic and attitude is second to none for the Red Devils. If you watch United’s games, you’ll often notice Rashford is always tracking back to help defend, even tackling in his own box like a right back! His commitment to the team once again bears resemblances to Rooney. Industrious, quick and working tirelessly for 90 minutes. 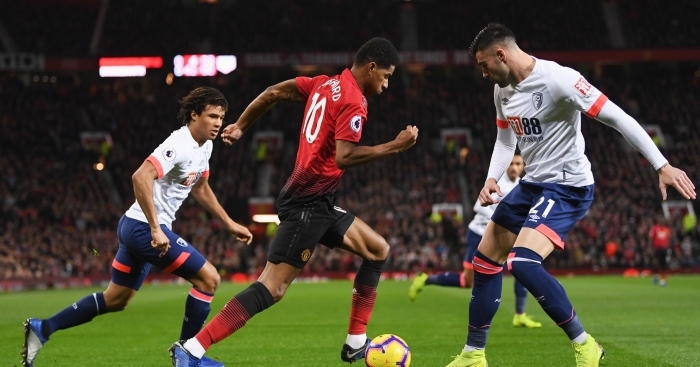 Thus far, there haven’t seemed to be any complaints or difficulties from Rashford at Old Trafford, despite not being played in his preferred position for a lot of last season. This humbleness and obedience has really made fans warm to him, perhaps why there is so much excitement over his recent form. Marcus Rashford is now reportedly in talks with United over a new contract (Sky Sports) and deservedly so. He’s on the path to becoming a top striker and we hope he can fulfil that potential for both club and country. For more articles like this, follow us @TasteofFtbl on Twitter!